Food and fluids are a basic human need. However they are much more than this. Food and drinks are often involved when we socialise with friends and family. We use them to celebrate special occasions such as birthdays and weddings or other key events in our lives. What we choose to eat and drink also helps us to express our beliefs and who we are as individuals. Providing food and drink to others can also be a way of showing hospitality to others or that we care. So how can dementia affect what you eat and drink? Activities that had previously been second nature can often become more challenging such as cooking and shopping and even eating itself when you have dementia. This can be frustrating and at times upsetting. However there are plenty of things you can do to make sure you keep getting the right nutrients your body need to keep you healthy and well. The more variety you eat the better! Try to include some meat, fish, poultry or beans/pulses at least twice a day. 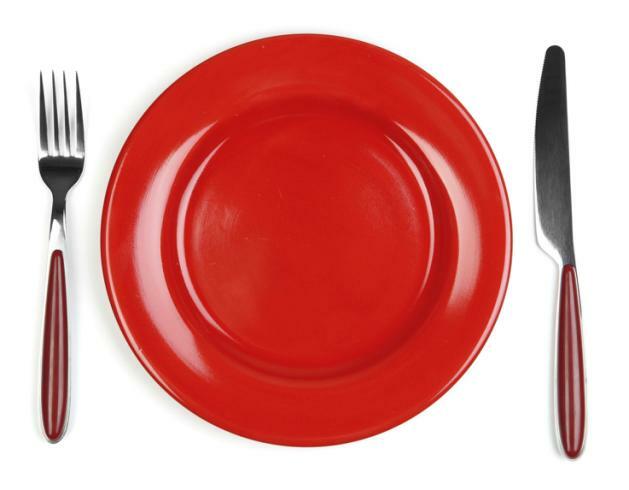 Have a starchy food such as cereals, bread, pasta, rice or potatoes at each meal. Have vegetables and/or fruit at each meal and include fruit as snacks. 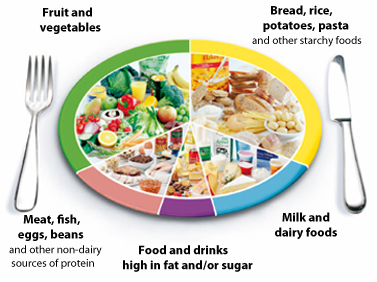 The eatwell plate* below gives you an idea of how your meals should look. Poor hydration can make you feel tired, lack energy, make you more prone to constipation and can add to memory problems. Make sure you get at least 8-10 cups of fluid each day. Be particularly careful during hot weather or if you are inside during the winter with the heating on high. Make a list of items you need, ask someone to shop with you or try online shopping. That way you are less likely to forget items you may need. If you are not comfortable using new technology, some voluntary groups are providing sessions to let you try it out with support. If you sometimes forget to have meals try setting an alarm on your mobile phone to remind you. Eat somewhere you find relaxing which is well lit and comfortable. If possible eat with others as this can be more enjoyable. Why not arrange a regular lunch or a coffee date with friends or family. You may also discover events in your local area such as community cafes that you might like to get involved in. Ask local voluntary organisations, the library or check in local newspapers or community websites to see what is going on in your local area. If preparing food is becoming a challenge – enlist the help of friends and family. Cook in bulk and freeze portions away for later. Label clear containers with the contents and when it was prepared. Use ready or part prepared foods; these can include fresh, dried, tinned or frozen foods to make things easier. Why not develop a check list or use recipes with clear instructions on each step. You could even tick each step off as you go to keep you on track. If you notice you have been losing weight without trying or you are not eating well for more than a week, then please speak to your GP or any other health professional for further advice. What kind of information about your nutrition would you find most useful? How would you like to access this information? 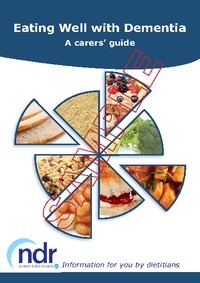 Do you know how a Dietitian could help you if you are having problems with your nutrition? What do you find most challenging about trying to maintain a good diet?